Have you ever wanted to flambé Windows? If your computer is set with to use the US English keyboard and you wanted to type words like, oh, flambé, that may be just what you want to do. 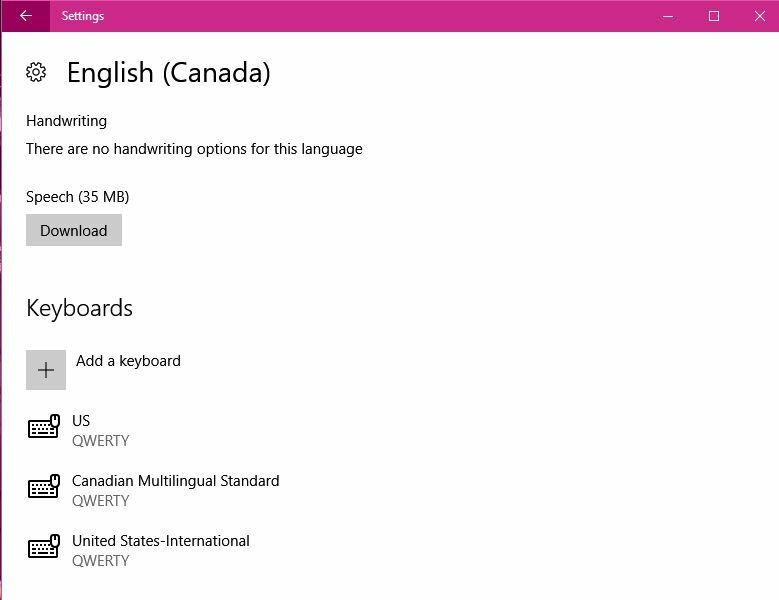 In Canada, both English and French are international languages, so many English Canadians find a need for characters that don't appear directly on the computer keyboard. Even unilingual Americans may want to appear more sophisticated, typing foreign-derived words like café or mañana. If you're using a program like Microsoft Word, you may have found the menu or ribbon item to insert 'special' characters. 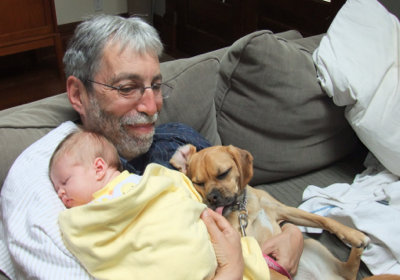 But if you're using some other piece of software, it may be less obvious. In Windows, it's never been quite so easy. Way back when, I encouraged folks needing to use accented or international characters to track down a chart of ASCI key codes, pick out the ones they needed, write them on a sticky note and paste it onto their computer display. Hold down the Alt key then, using the number keypad on the keyboard (remember those?) type a zero followed by the three number code. Lift the Alt key and bingo! - the desired characted appears. For instance, Alt+0224 = à. There were other ways to get the same thing - in 2001 I wrote a tutorial titled 'Getting Easy Access to International Key Characters' describing how installing the International English keyboard might make some users' lives a bit easier. Today I learned a trick for Windows 10. (It may work in Windows 8 as well). It makes use of the fact that Microsoft designed that operating system for both standard desktops and laptops as well as for touchscreen models like tablets. iPads and Android tablets include built-in virtual keyboards - and even if you don't have a tablet, a Windows 10 system offers an optional virtual keyboard as well. And that virtual keyboard can be used to insert all those accented or otherwise modified letters. To do this, start by right-clicking on an empty bit of the Windows taskbar. A menu will pop with various things you can do to the taskbar. The fifth item offers the option to 'Show Touch Keyboard Button'. With that selected, you'll see a keyboard icon towards the right-hand end of the taskbar. I suppose if you have a touchscreen display or a Windows tablet, you could enter text using this keyboard - I don't have either and it seems to be a bit clumsy to type using it with a mouse or touchpad. But if you hold your left mouse button down over some of the letters - for instance the letter 'a' - a cool thing happens. Just like on a Mac you get to see the variety of optional characters based on that letter. Click on the one you want, and voilà, it's inserted at the cursor. Pretty cool, eh? But that's not all you can do with this virtual keyboard. Notice, for instance, that there's a key with a happy face on it - not surprisingly clicking that gives you a keyboard filled with smileys and other emoji faces. You get a degree symbol, a copyright symbol, Euro and UK pound symbols and a few more. The 1/2 key holds its own trick. 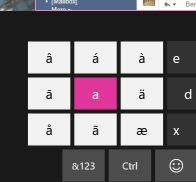 Just a holding your mouse button down while pointing at the letter 'a' gets the various accented characters shown above, the 1/2 key can be used to access a set of other often-used fractions. Nevertheless, poking around on an on-screen virtual keyboard - whether with your finger on a touch-screen or with a mouse - is awkward. There's another way that maybe is a bit more subtle. To do this, you want to add additional keyboard layouts. In Windows 10, start by opening Settings - this looks like a Gear icon (with the text name Settings in the original Windows 10 but with no text on the lower-left of the Start Menu in the Windows 10 2016 Anniversary Update). 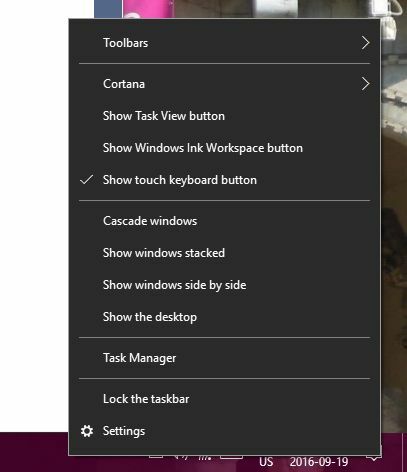 Alternatively, if you click the Notifications icon on the far right corner of the Taskbar (it looks like a cartoon speech bubble) All Settings will be one of the Quick Settings buttons. 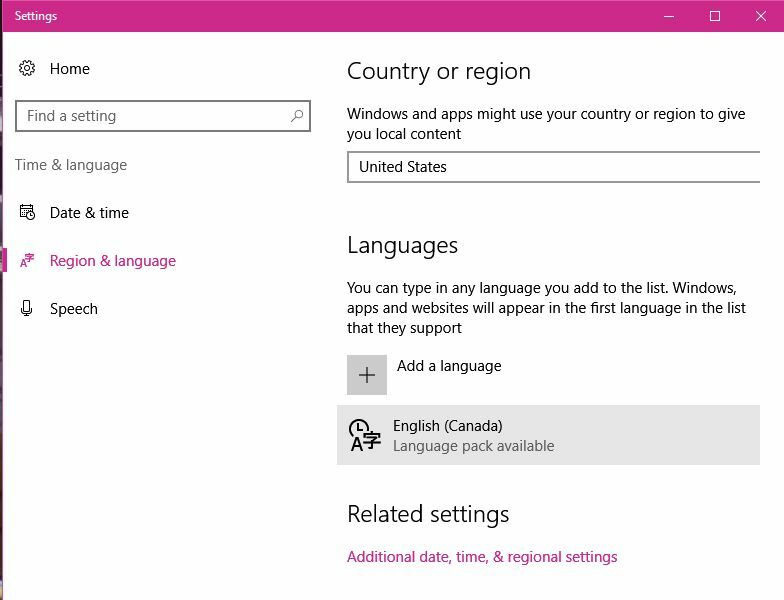 Go to the Time & Language area and then pick Region & Language. ... and choose the United States - International keyboard. It won't take long. Once it's installed, though, using it is not necessarily intuitive. In the lower-right, on the Taskbar beside the time/date you'll see an indication of which keyboard is currently active - perhaps the default ENG-US. Clicking on that will let you choose from the set of installed keyboards, letting you pick ENG-INTL. Circumflex (the ^ character)... with the International keyboard, holding down shift+6 (which gives the circumflex), followed by the letters a or e produces that vowel with a circumflex. Accent Grave is produced by typing the single quotation mark ( ' ) followed by a letter a, e etc... the result is an accented vowel. Acute Accent is produced using the apostrophe (the unshifted character underneath the tilde-- not the single quotation mark) followed by an a, e, or i.
Tilde--this key (usually next to the number 1-- note you need to hold down shift) followed by an a or an n produces that character with a tilde on top. Umlaut: use the double quotation mark ( " ) followed by an a, e, i, etc. to produce those two little dots over the letter. (Thanks to Adrienee Mahafey for telling me the name of the two dots, also known as a "diaeresis"). Note that you will only get the special character if you type the key combination for a letter which can use one of those characters... if you type a contraction like isn't for example, you won't end up with an accent grave over the letter t.
But what if you actually want to get the character on the key-- single or double quotation marks, for example? To do so, press the key followed by the space bar. This can be a bit of a pain when putting a phrase in quotes.